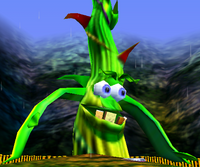 The Beanstalk is an enormous plant located in Fungi Forest in Donkey Kong 64 that grew from a small, pink seed found by Tiny Kong. Tiny finds the seed inside a tree stump, after she defeats a large group of Purple Klaptraps. After that, she must plant it in some fertile soil, where it grows almost instantly. At the top of the Beanstalk is a Golden Banana, which Tiny must acquire by getting a ride from Squawks the Parrot after shrinking. ↑ Donkey Kong 64 Banana Guide on Nintendo.com, Nintendo. Retrieved November 24, 2014. This page was last edited on September 21, 2018, at 00:29.